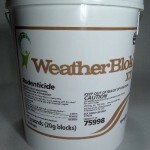 PRODUCT DESCRIPTION: For an optimal level of both palatability and weatherability, there’s Weatherblok® XT. These outdoor bait blocks contain the advantages of Talon-G, in a formulation that withstands the elements-even in damp places where the competition falls apart. It also has a unique shape, which allows for high density baiting and features gnawing edges that entice rodents to consume a lethal dose. WHERE TO USE IT: Determine areas where rats and/or mice will most likely find and consume bait. Remove as many other rodent food sources as possible. 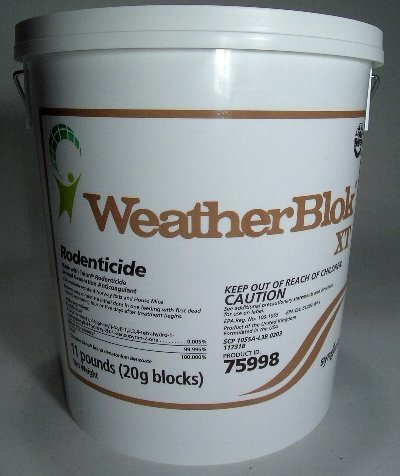 For the safety of others, Weatherblok XT should always be applied out of reach by children, domestic animals and non-target wildlife, or in tamper-resistant bait stations such as the Multiplex Station. RATE OF APPLICATION: Apply as needed until rodent activity subsides. Tamper proof bait stations filled with bait can be used to prevent future infestations.